Statements can be a great opportunity to improve the patient experience and expedite collections, or they can lead to frustrated patients, lower self-pay revenue and increased bad debt. As pioneers of the healthcare industry’s patient-friendly initiative nearly 10 years ago, RelayHealth continues to research and innovate. Its most recent patient focus group provided input on how statement design impacts their satisfaction with the hospital, post-discharge experience and willingness to pay. 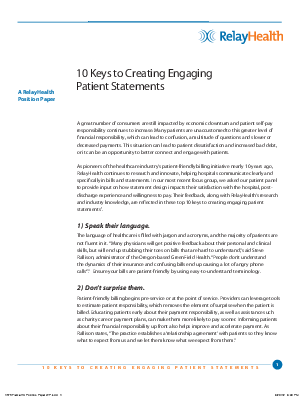 Learn the critical components to creating patient statements that get results and help compel patients to pay: Download the 10 Keys to Creating Engaging Patient Statements today.